HearthSong Exclusive - Kids can have fun—and be active—together with our unique trampoline built for just for two! Oval in shape, each jumper has a circle to jump within and a handle bar across the center of the trampoline to share. The foam-covered handle bar is sturdy enough for tricks as the jumping gets going, allowing their imaginations to jump as high as they can! The handle is adjustable and designed to grow as kids do, so there are years of active fun to come. The 56" x 35" durable mat is 9" off the ground and tightly stretched for optimal bouncing. It's able to handle a maximum weight of 180 lbs. A thick cover wraps around the outside of the trampoline, keeping little toes safe from being pinched or caught between the springs and the frame of the trampoline. 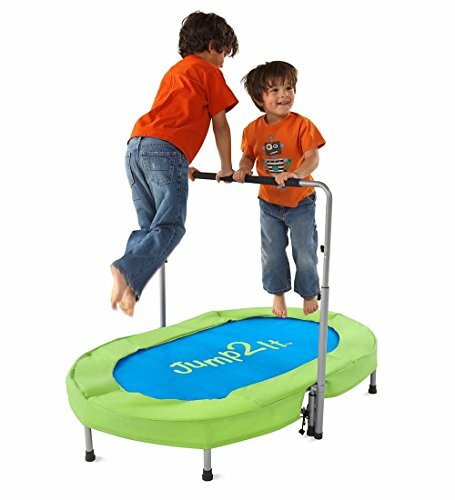 Keep your trampoline indoors to keep kids active in all weather. It's a must for every family, a wonderful gift for children ages 3 and up, and a huge hit for parties. For ages 3 and up; adult assembly and supervision required. Mat measures 56" x 35" x 9"H; handle adjusts from 24½" to 35"H.